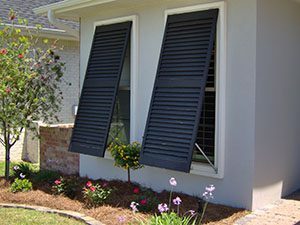 Aligning with the architecture of your home, rolling shutters are stored in an enclosed box above the window when not in use. A crank handle or motor is used to lower them when needed. If you want your shutters to add a decorative touch to your home, consider colonial shutters. They are attached to the outside of your home and fold easily together to protect your windows during a storm. Bahama shutters provide more than just hurricane protection. They can also shade your windows on sunny days when propped open. Accordion shutters are permanently affixed to the windows and unfold when needed during a storm. They won’t need to be stored when not in use or provide a bulky aesthetic. Our most affordable option, storm panels are secured to your windows using bolts or tracks. They are removable and will need to be stored away somewhere in your home when not in use. We offer aluminum and clear storm panels. Get in touch with Majors Home Improvement to learn more about our hurricane window protection service. We’re proud to help homeowners in the Destin area protect their homes during storm season. We're Eager to Get Started!